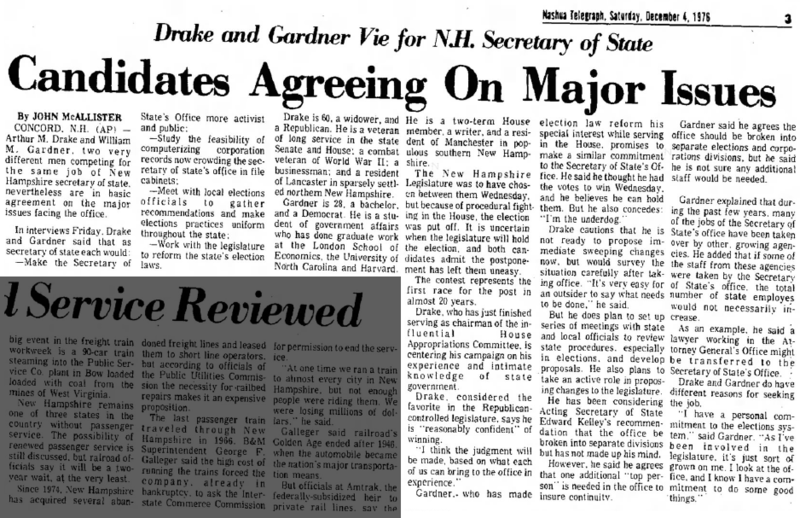 In his first bid to become Secretary of State, Bill Gardner was a reformer taking on an opponent who had lots of institutional experience. Four decades later, he finds himself on the other side of that battle. On one side, there’s an ambitious young politician pitching himself as the man to bring overdue reforms to the New Hampshire’s election system; on the other, there’s an elder statesman drawing on deep institutional ties and a long resume in Concord to win over votes. This might sound a lot like this year’s race for Secretary of State, which pits former gubernatorial candidate Colin Van Ostern against 42-year incumbent Bill Gardner. 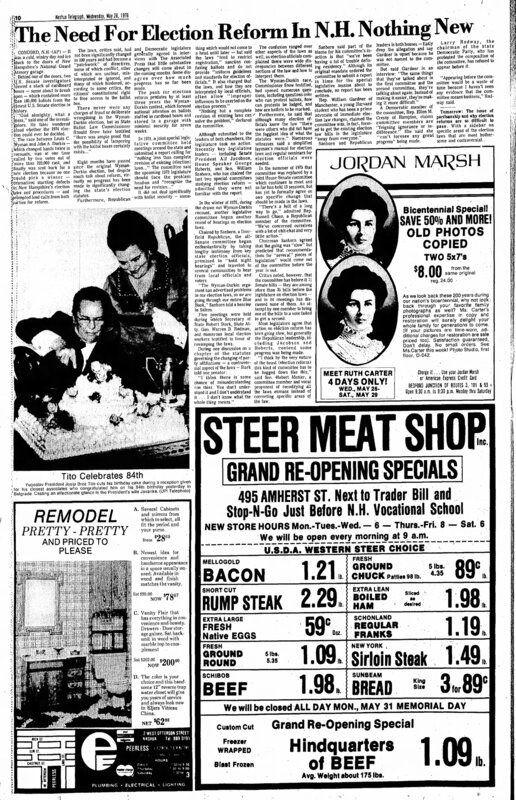 But it also describes Gardner’s first campaign for Secretary of State — back in 1976. 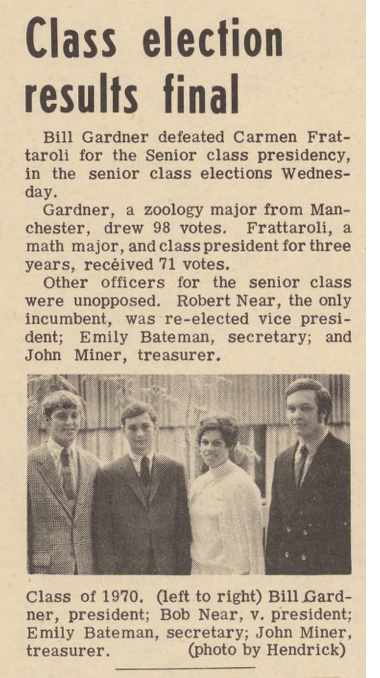 Gardner's victory as senior class president as reported in UNH's student newspaper, The New Hampshire, in May 1969. 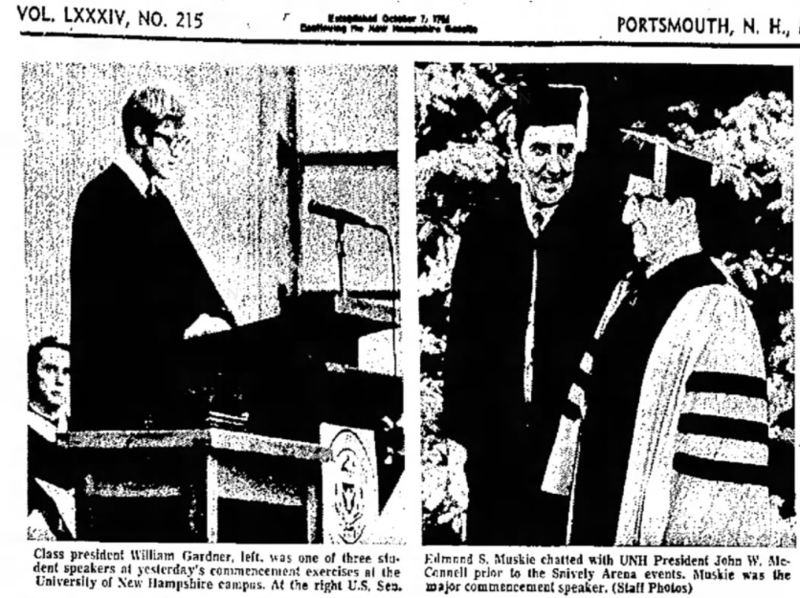 As his senior class commencement speaker at UNH, Gardner "received a standing ovation for his speech" preaching civility and common ground at a time of escalating protests. He also shared a stage with U.S. Sen. Ed Muskie, a future presidential candidate. 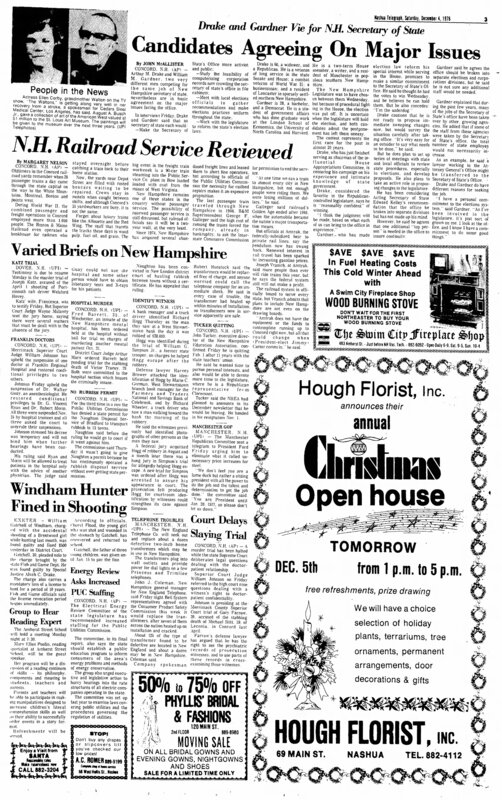 Long before he became known as the protector of the first-in-the-nation primary and the country’s longest-serving Secretary of State, Bill Gardner was an up-and-coming Manchester Democrat, a former UNH class president who was making a name for himself as a cerebral young changemaker in Concord. 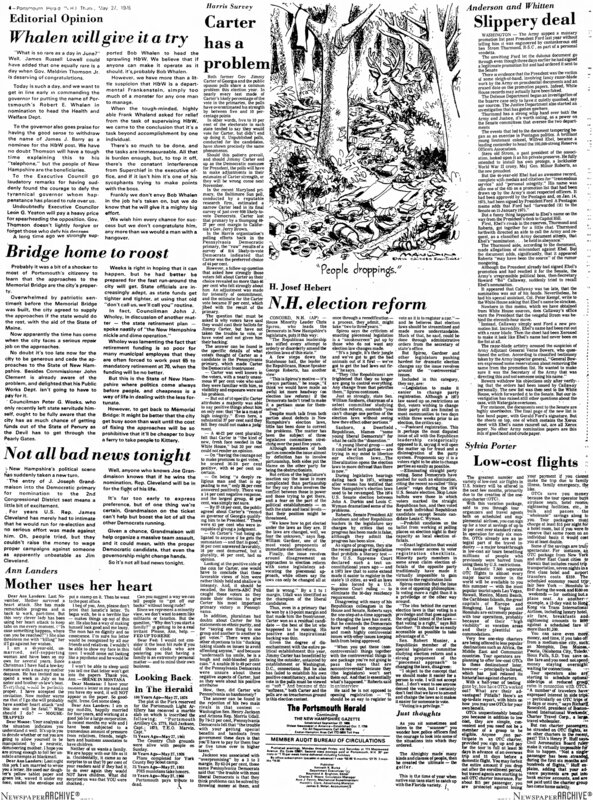 Normand and Gardner served together in the Legislature back in the early 1970s, part of a generation of newly inspired lawmakers who swept into office on a wave not unlike the one that hit the New Hampshire State House this year. Now a Manchester attorney and former executive councilor, Normand recalls Gardner was “serious but congenial” — someone whose interests ranged from his studies at the Harvard Kennedy School to hunting to chicken farming. In the Legislature, Gardner earned a reputation as a champion for election reform. He rallied behind policies to make it easier to vote and easier for young people to serve in the State Senate — speaking in support of a proposal to lower the age requirement from 30 to 25. But there was only so much he could do as a member of the minority party. So when a vacancy opened up in the Secretary of State’s office, Gardner — barely 28 years old but already heading into his third term — saw his opening to have a bigger impact. 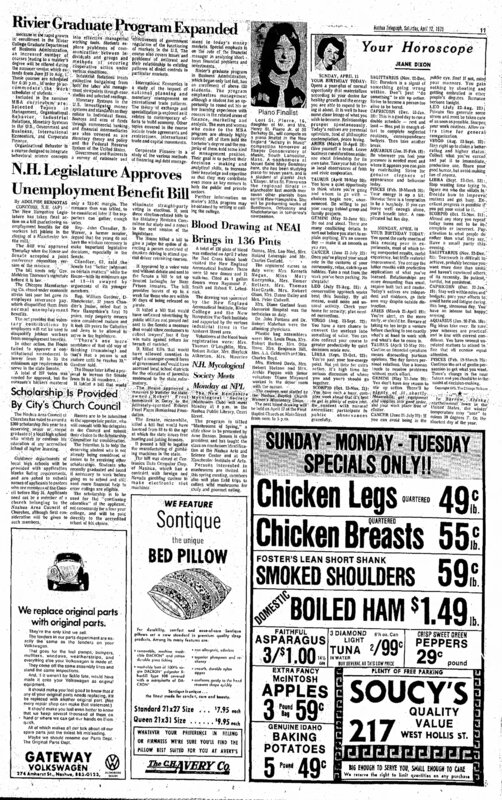 Excerpts from news stories about election reform efforts in 1975 and 1976. Before Gardner could make that dream of leading the state's elections a reality, there were a few hurdles he had to clear first. For one, there was another rookie state representative who was also cooking up the same idea: The then-Representative from North Conway, Steve Duprey, now a Republican National Committeeman. When Duprey and Gardner did sit down to chat about the position — during one of many nights of what we’ll call off-the-clock bipartisan socializing — it became clear Gardner saw things differently. It turned out to be an easy sell. After clearing one opponent from the field, Gardner still one more to deal with: a Republican veteran of the State House three decades his senior, Lancaster Rep. Arthur Drake. Drake was a well-known businessman and chairman of the powerful House appropriations committee who “center[ed] his campaign [for Secretary of State] on his experience and intimate knowledge of state government,” according to a writeup in the Nashua Telegraph. 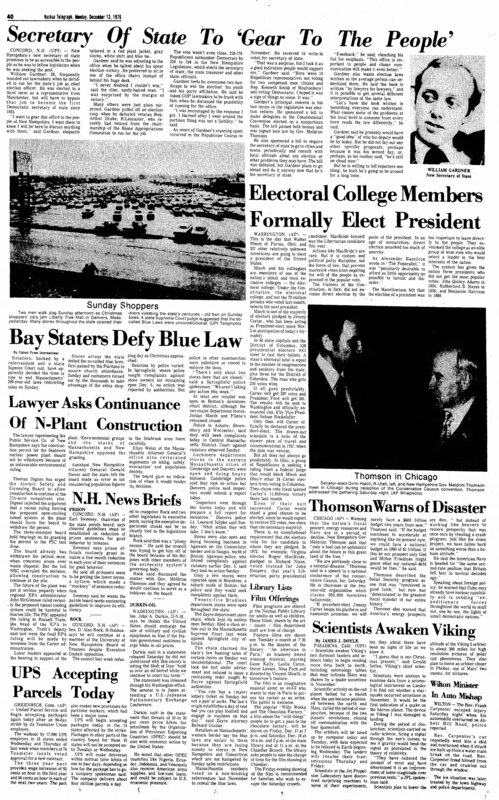 And while Democrats made gains in the 1976 elections — thanks in part to a plan that Gardner reportedly helped to shepherd, dubbed “Project 201” — Republicans still held the majority. So any Democrat, and especially one as young as Gardner, was going to face an uphill climb to rack up the votes needed to become Secretary of State. But Gardner had a plan, and he enlisted his friends from the Legislature to help. While his friends were making calls, Gardner was making trips — crisscrossing the state to knock on the doors of as many legislators as he could, from both parties, to personally ask for their vote. And Melnick, who’s now the Tip O’Neill Professor of Political Science at Boston College, says this is where Gardner’s early track record as a politician really paid off. But when the results were tallied, the numbers were great for Gardner: He beat Drake 218 to 174, meaning he picked up votes from at least a few Republicans who might otherwise have sided with Drake. One of those votes came from Duprey, the same guy who almost ran against him. In a column published shortly after his election, Gardner outlined some of his proposals for reform. 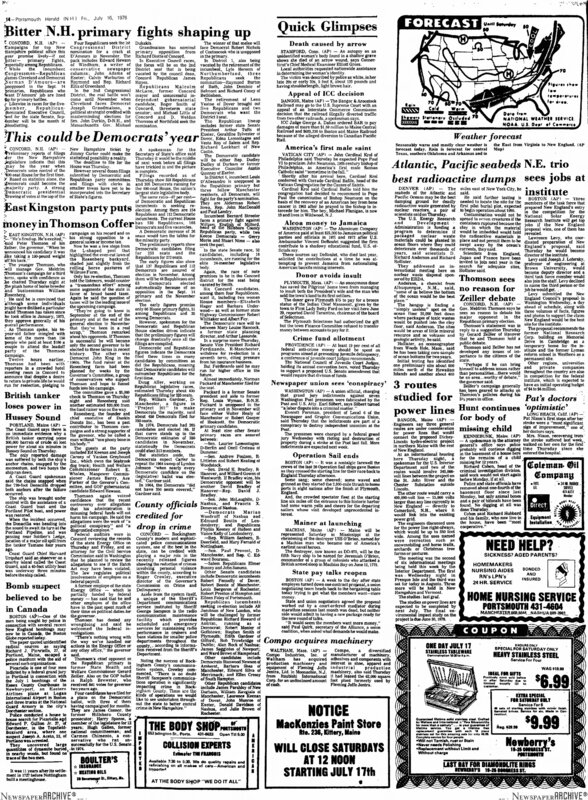 That 1976 campaign for Secretary of State differed from this year’s race in several key ways. First, partisan lines weren’t quite as rigid as they are now — in matters of election law or otherwise. Moreover, the man trying to play the reformer role that once belonged to now-70-year-old Gardner — 39-year-old Colin Van Ostern — has been waging a full-blown public campaign for the seat, complete with a quarter million dollars in fundraising and plenty of press releases. Gardner, in contrast, did a lot of his campaigning under the radar. Still, the people who were around for that first contest say the echoes between then and now are hard to ignore. Gardner hasn’t faced an opponent as serious as the one he’s up against this year since 1976, and has managed to sail through re-election with relatively little trouble. Lawmakers will gather once again in Concord on Wednesday to decide whether to give him a 22nd term or go with someone new — and no matter the outcome, in some way, history will repeat itself. Wednesday is the day lawmakers will pick New Hampshire’s next Secretary of State, and both candidates—42-year incumbent Bill Gardner and his challenger, former executive councilor Colin Van Ostern—are hustling for support. It was a scene you'd expect at your average campaign launch: dozens of supporters gathered at a press conference just steps from the State House, top party officials waiting to offer endorsements and a well-endowed fundraising committee waiting behind the scenes. An average campaign launch — except for the fact that any kind of campaign for this particular office, New Hampshire’s Secretary of State, was all but unprecedented.